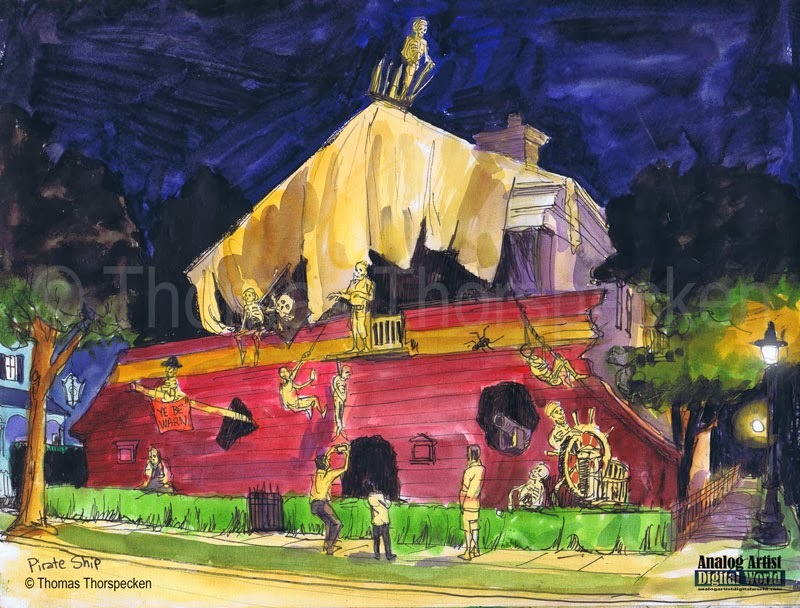 On the day after Halloween, I found out about this pirate ship display at 160 Celebration Avenue in Celebration FL. Photos I had seen showed the ship lit up with spot lights. When I arrived it was still light out. I sat under a street light and started to sketch. As it grew darker it became harder and harder to see the details of the display. I probably missed up to a dozen skeletons hidden in the darkness. I wasn't the only one hoping the display would light up one more time. People parked in the street and got out to take flash photos of the dark facade. The display was actually a bit ominous in the pitch black. I wonder if this was someone from Disney Imagineering who needed a creative outlet. The use of the roof line to hang ripped sails was the least well planned aspect of the display. Black plastic garbage bags were taped up behind the sails to guarantee black negative shapes. The crows nest was tilted uncomfortably to the side. Maybe next year they will devise some sort of masts. Although November 1st is the Day of the Dead, the pirate ship stayed dark. Twice cars stopped to ask me directions to the Celebration High School. I couldn't help. If you sit on a street corner, you become a community expert. Walking back to my car I passed a much smaller Halloween display that featured Mickey and Minnie Mouse. My stomach turned.